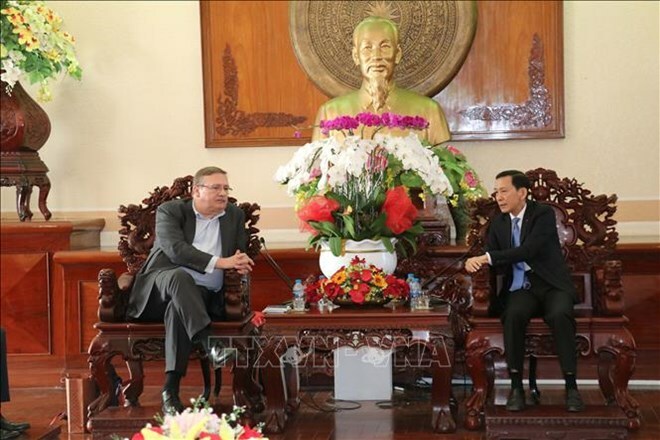 Can Tho (VNA) – Hungarian Ambassador to Vietnam Ory Csaba and Can Tho authorities sat down on February 12 to discuss cooperation activities, including the organisation of a Hungary cultural week in the Mekong Delta city this year. At the meeting, the Hungarian diplomat said his country wants to promote its culture in Can Tho and in Vietnam, adding that the country hopes its businesses and cuisine will be introduced through the partnership formed between the two nations. As heard at the meeting, the upcoming cultural week is expected to be co-organised by Can Tho, Hungary’s Kaposvar city, and the Hungarian Ministry of Foreign Affairs and Trade. It will feature the European country’s fine art paintings, films, and music; an exchange between Can Tho and Kaposvar universities; and business networking events. Chairman of the Can Tho People’s Committee Vo Thanh Thong lauded the initiative of organising the cultural week in the city. He said that room for collaboration between Can Tho and Hungary remains extensive, with bilateral cultural exchange playing a key role. The municipal leader said the local Department of Culture, Sports and Tourism; the Department of External Relations; and its Union of Friendship Associations will be tasked to coordinate the event. At the meeting, the host, guest and contractor of the Can Tho Oncology Hospital also reached an agreement on solutions to clearing paperwork issues for the construction of the hospital to soon begin. The Hungarian Government has provided preferential loans for the project. Ory Csaba said that he is pleased with the solutions, adding that he will keep track of the construction’s future progress.